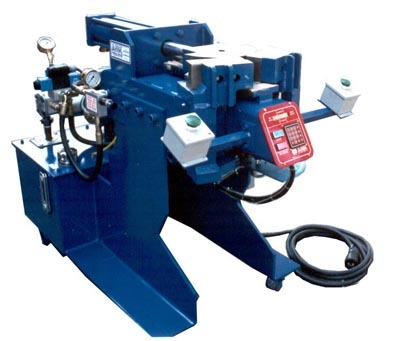 Model 100P-SADC2P High Production Tube Bender : American Machine and Hydraulics, Inc. The Model 100P-SADC2P is a high production tube bender. This unit can bend up to 1200 bends per hour based on 90° bends. Tube diameters vary from 1/2" (12.7mm) to 2" (50.8mm). It operates with (2) palm buttons and has a plc system to control all sequence of operation automatic or manual. It is electrical driven, hydraulic powered. Special digital readout with 15 bend program control available. Extra large hydraulic reservoir to insure against overheating due to the speed and pressure. This unit generates up to 20 tons of bend forces. Maximum bend radius 5" (127mm) minimum bend radius 2.5" (63.5mm). ©2013 American Machine and Hydraulics, Inc. All Rights Reserved.